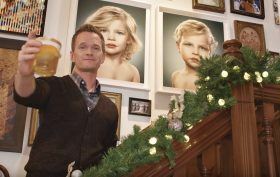 Neil Patrick Harris and hubby David Burtka first made real estate headlines when they purchased a $4 million Harlem brownstone in 2013, setting a neighborhood record. They then spent over a year renovating the five-story residence at 2036 Fifth Avenue to be the perfect family home for their twins Gideon and Harper (now five years old) and two dogs. Last year, the couple invited Architectural Digest in for a tour, showing off their elegant but fun design choices, impressive art collection, and restored architectural features. They’ve now opened up their home again, this time for Vogue’s 73 Questions (h/t Apartment Therapy), complete with Christmas decorations.